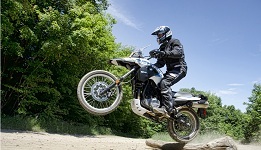 You can use your own Adventure Bike or one of our BMW GS units. Many new Adventure Bike riders watch the videos or the Long Way Round and are disappointed when they can’t ride to the bikes potential. 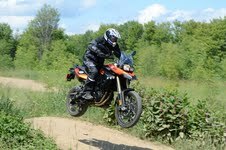 Our patient instructors will assist you with proven curriculum to become more comfortable off road. If you haven’t ridden off road much then we suggest using one of our smaller dirt bikes in the morning session. Then after a nice lunch take out your (or our) Adventure bike on light, easy trails. BMW "GS" offroad certified instruction.